Feel the need to get away - far, far away - to a magical place completely different from anything you're used to? Take a flight to Pulau Sumba. The island is defined by its uniqueness -- even within Indonesia. It’s known as “Bali as it was 30 years ago”. This remote island in Eastern Indonesia, part of the Lesser Sunda Islands group in East Nusa Tenggara –is a 50-minute flight east of Bali. With its "rugged undulating savannah and low limestone hills," its physical characteristics bear hardly any semblance to the other islands of Indonesia. The terrain on Sumba is quite different to its neighbouring islands; rolling hills replace the typical volcanic terrain in other parts of Indonesia. Many areas in the North and East of the island resemble dry savannahs, whilst central highlands are covered in native Alang Alang grass and the mountains in the South extend down into lush tropical vegetation. There are no volcanos. Sumba has an area of 11,153 km2 (pop. 656,259). Its nearest landmarks are Sumbawa to the northwest, Flores to the northeast. To the east, across the Savu Sea, is Timor, and to the south is Australia. There is much to be discovered in Sumba: lots of culture, traditional lifestyle, friendly, and hospitable people, bizarre landscapes, untouched nature, and many beautiful beaches. Historically, this island exported sandalwood and was known as Sandalwood Island. Before its discovery by Western Europeans in the 1500s, Sumba was inhabited by Australian and Polynesian people. In 1522 the first ships from Portugal arrived, and by 1866 Sumba belonged to the Dutch East India Company (VOC). At that time the air was filled with the sweet-smelling aroma of sandalwood forests that covered the island and remained, centuries later, a highly sought after commodity. Sumba has a semi-arid climate. The east is characterized by the hot north-Australian climate. There is a dry season from May to October. From November to April it might rain. The monsoon or rainy season lasts about 3 months in the east and up to 5 months in the west. Rainfall ranges from 800-1000 mm per year in the northeast to 1000-1500 mm in the central region and up to 1500-2000 mm in the south-western part of the island. In East Sumba the average temperature is 27º - 36º C. In the west the average is 2-3 degrees cooler. Night temperatures are significantly lower than in Bali. During July to September night temperatures sometimes drop down to 15º. The highest temperatures occur before the first rains in October or November. The best time for travelling nature lovers is from April to July, after the monsoon, but it is still green. In the Southwest of the island, from October to mid-December is also possible, when it becomes a little greener due to sporadic rains. The surfers' season is from May to October. For swimming, the waves at some beaches on the south coast are too high from July to September. Sumba is one of the few places in the world in which megalithic burial dolmen are used as a 'living tradition' to bury prominent individuals after death. Burial in megaliths was a practice in many parts of the world during the Neolithic and Bronze Age, but has survived to this day in Sumba. At Anakalang quadrangular adzes have been unearthed. The largest town and main port on the island is Waingapu (pop. 52,755). The landscape is low, limestone hills. There is a dry season from May to November and a rainy season from December to April. The western side of the island is more fertile and more heavily populated than the east. Due to its distinctive flora and fauna Sumba has been categorised by the World Wildlife Fund as the Sumba deciduous forests eco-region with a mixture of plants and animals of Asian and Australasian origin. Most of the island was originally covered in deciduous monsoon forest while the south-facing slopes, which remain moist during the dry season, were evergreen rainforest. There are a number of mammals including saltwater crocodiles, but the island is particularly rich in birdlife with nearly 300 bird species, of which seven endemic species and a number of others are only found here. There are four vulnerable species: the secretive Sumba boobook owl, Sumba buttonquail, red-naped fruit-dove and Sumba hornbill as well as three more common species: the Sumba green pigeon, Sumba flycatcher, and apricot-breasted sunbird. Most of the original forest has been cleared for the planting of maize, cassava and other crops so only small isolated patches of trees remain. Furthermore, this clearance is ongoing due to the growing population of the island and this represents a threat to the birdlife. Two national parks have been designated on the island for the protection of endangered species: the Laiwangi Wanggameti National Park and Manupeu Tanah Daru National Park. Walking only, almost no facilities. 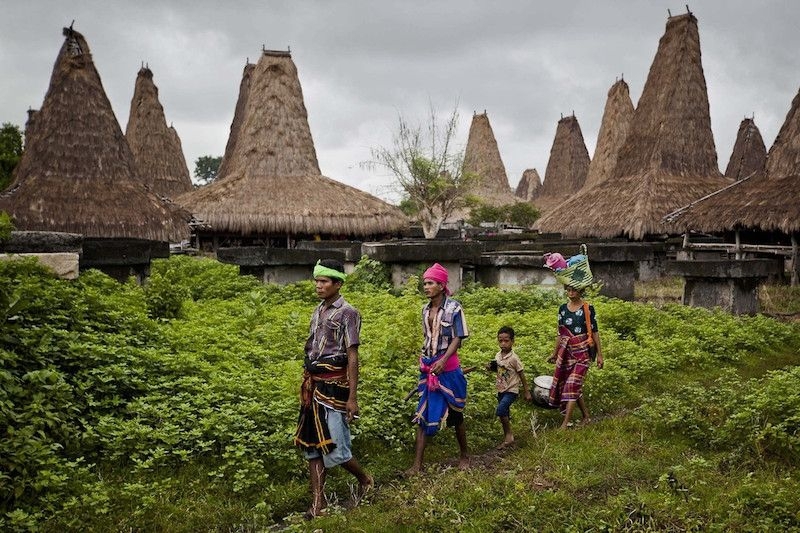 Sumba has a highly stratified society based on castes. This is especially true of East Sumba, whereas West Sumba is more ethnically and linguistically diverse. The Sumbanese people speak a variety of closely related Austronesian languages. Besides the national language, Bahasa Indonesia, there are 6 regional languages. The common name for all of them is Bahasa Daerah or Bahasa Sumba. In West Sumba they are completely different. In East Sumba there is one Language but with many local dialects. The largest language group is the Kambera. 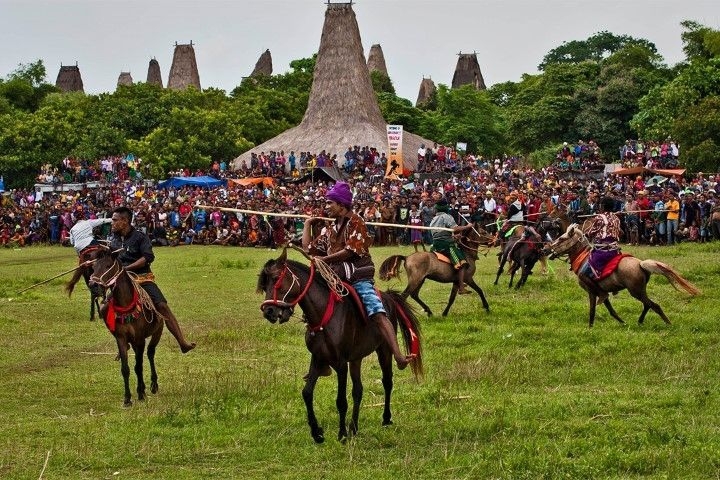 It is spoken by a quarter of a million people in the east of Sumba. There are no books or lexicons; history is passed down orally. English is only helpful in towns. A knowledge of Bahasa Indonesia will be helpful in the centre of the island. 25-30% of the population practices the animist Marapu religion. The remainder are Christian, the majority being Protestant, with a minority being Roman Catholic. One can see an authentic, ancient culture with none of the layers of Hinduism or Islam found elsewhere in the country. Traditional dress is still observed in day to day life; men wear a short sarong (hinggi) around their hips with belt and sword and a band or turban of woven Ikat with motifs. Women wear long sarongs and headbands with different motifs. Sumba is famous for the ikat textiles, particularly very detailed hand-woven ikat, which is prepared on the island. The process of dying and weaving ikat is labor-intensive and one piece can take months to prepare. A long-lasting tradition is the sometimes lethal game of pasola, in which teams of often several hundred horse-riders fight with spears. Traditional villages and settlements are commonplace with traditional houses constructed over three storeys in a wooden structure, high pointed roofs made from native Alang Alang grass and sides of plaited bamboo. The construction of a house is accompanied by rituals and is believed to be a social and ceremonial unit. Sumbanese usually build their houses and villages on hills or mountains. They build so as to be protected from enemies and be closer to the spirits and ancestors. They surround their villages with a stone wall with 2 gates: the entrance and exit. In the middle of a village is a yard with tombs and sacrificial altars (Kateda). The houses with their high, pointed Marapu roofs form a circle around it or are arranged in 2 parallel rows. The houses are a wooden structure. The lower columns are surrounded with rings made from wood or stone, they symbolize "Lingga" and "Yoni”, the sexual aspect of life, and serve as a symbol of fertility. The columns represent the cardinal directions. The fireplace in the middle is the symbol of the sun. The roofs are normally made of Alang grass, but also from the fan-shaped leaves of Lontar palm trees. These roofs do not last much longer than 5 years. Tarimbay Bay, 120 kilometers from Waingapu in 5 hours’ drive, is surfer paradise with 2 to 3 meters tall waves between June and September. Right in the capital city of Waikabubak, you can see the ancient tombs: Kadung Tana, Watu Karagata, and Bulu Peka Mila. Tarung Village, an important ceremonial center, is located on top of a hill, just a half kilometer to the west of Waikabubak. There are several megalithic tombs. The fronts of many traditional houses are decorated with huge water buffalo horns from the animals sacrificed during rituals of past years. Two National Parks, designated in 1998: Laiwangi Wanggameti National Park and Manupeu Tanah Daru National Park, in order to protect nature. Particularly in Laiwangi Wanggameti National Park, there is absolutely no infrastructure. A well-known ritual is 'pasola' from February to March, where hundreds of men on horses throw spears at each other. The tips of the spears are cut off, but serious accident do occur. The exact date and time is dependent on the arrival of the small 'Nyale' worm on the coastal sands. 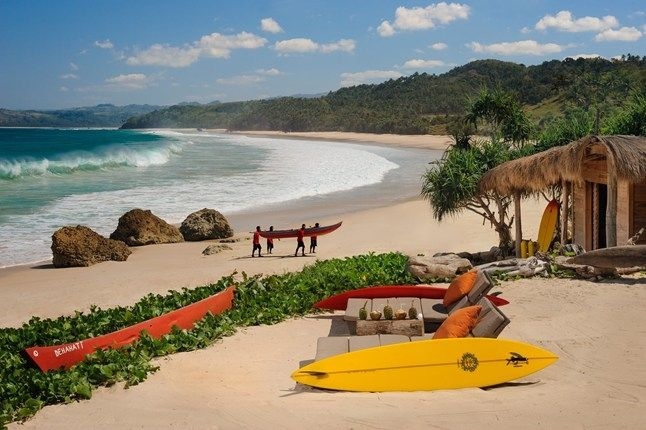 Just 100 yards off Nihiwatu Beach is one of the world's most perfect waves. Nihiwatu faces southwest into the azure Indian Ocean and is ideally suited for picking up swell arriving from thousands of miles away in Antarctica; the surf here is very consistent. Here one can enjoy a crowd free surfing experience. 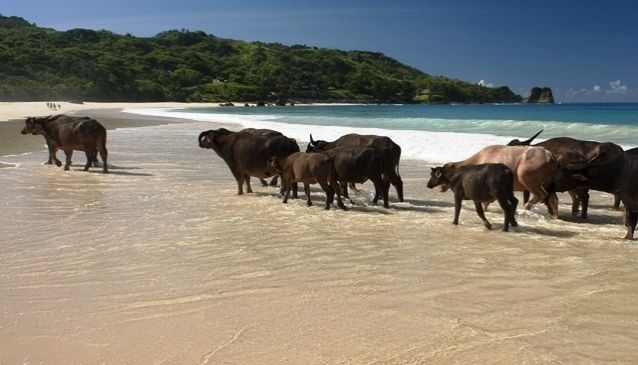 Nihiwatu Resort offers a wide range of exciting land and sea based activities or treks to spectacular areas that are so remote that they can only be accessed by trekking or boat. There are breathtaking waterfalls, fabulous beaches and incredible Stone Age villages for you to experience. There are few roads, houses or fences to block your way. Sumba horses may be small but they are feisty, so be prepared for a challenging ride to secluded beaches, through forested countryside and to traditional villages. For a really memorable riding experience, you could go for a ride along the beach at full moon. Mountain bike tours are available for those wanting to work-out while covering some interesting terrain; everywhere you go there are panoramic views of the mountains and sea, small traditional villages with high peaked grass roofs, buffalo and horses, and the smiling Sumbanese children. There are few islands in Indonesia where uninhabited space is the norm ... in Sumba it is. All manner of hikes and treks for all levels of endurance and skill, from rather strenuous overnight trips through heavily forested mountainous areas to something easier like the popular hike to a waterfall that will cause your jaw to drop. Half day and full day jeep tours to beaches and important traditional villages and markets. A visit to a Sumba village is a must; it’s one of the most interesting things you can do during your stay. Small groups of guests provide a more intimate experience, also better for village life. Exceptional fishing grounds are only minutes away in a fully equipped deep-sea fishing boat. Here you have the best chance in Indonesia of catching all kinds of big fish. Large Marlin, weighing more than 300 pounds and Yellowfin Tuna over 150 pounds migrate close to the coast during the months of August through January, but there are masses of sizeable 130 pound Sailfish, 30 to 40 pound Spanish Mackerel and Wahoo, and 40 to 70 pound Trevally in the area throughout the year just waiting to be caught. Sumba offers a choice of diverse dive sites. There is heart-pounding adventure diving on reefs and seamounts along the coast where masses of large pelagic fish congregate. Divers have even experienced close encounters with large Marlin, Sailfish and even Blue Whales. Adrenaline rushes are guaranteed. The West Sumba coastline is absolutely stunning! You will pass perfect beaches and gape at massive cliffs adorned with jungle and palms, all backed by distant mountains. Local companies will take you to spectacular areas that are so remote that they can only be accessed by boat. Sailing along a scenic coastline is an exhilarating experience and one should take the opportunity of a full day excursion which can include fishing, snorkeling and delicious picnics under the trees on the beach. With more than 300 species of birds, Sumba is a twitchers’ paradise. The island is blessed with eight endemic species found nowhere else on earth including hornbill, fruit dove, button quail and paradise flycatcher. Nature lovers we can take a walking tour through lowland tropical forest where you will see hundreds of birds. Perhaps you might see wild buffalo and groups of monkeys as well. Info from Wikipedia and other sources. Main source and thanks to Matthias Jungk for intensive research.